Simple, Mission style, with a touch of Rustic flair make our Amish Crossan Panel Bed easy to incorporate into any bedroom decor! The natural beauty and character of the hand-selected hardwood is easy displayed in each panel and will exemplify the elegance of handcrafted Amish furniture. Include the three drawer storage units for a convenient way to store linens, spare bedding and other items right where you need them. Our Crossan Panel Bed is handcrafted from an array of the region's finest solid hardwood to ensure character in each grain and longevity of your unique heirloom quality piece, so you can feel confident passing it down for many generations! Pick the perfect size to fit your space, from Twin to California King, and the best wood/stain combination to customize the perfect bed to fit the vision of your dream bedroom decor! 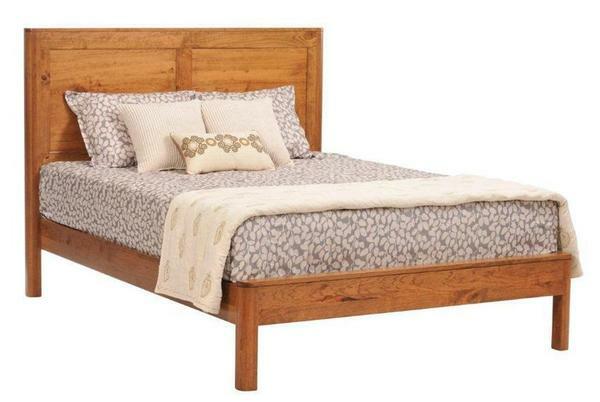 Please call one of our Amish Furniture Experts today with any questions you may have about our Crossan Panel Bed. We also offer stain samples, so you can pick your favorite or match your current bedroom furniture.